by Eset, spol. 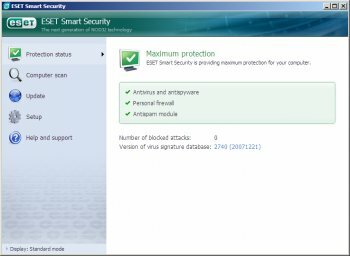 s r. o.
ESET Smart Security is a fully integrated security solution that includes antivirus, anti-spyware, a personal firewall and an antispam module. It features an improved graphical user interface with 2 operating modes for common and advanced users. The program uses a smart cleaning algorithm that automatizes the procedure of malware removal. Updates are delivered through very small incremental update files to ensure little traffic especially for dial-up users. The configuration can now be exported to xml files. This DOES NOT work on Windows 10 builds 10122 and up. Disables network connectivity regardless of what you do. Getting connection back may involve uninstalling, reinstalling, then uninstalling this product again, as well as uninstalling and reinstalling drivers etc. If you're dumb enough to try this, MAKE SURE you create a usable restore point prior to installing this. I've used Eset for years and I prefer it over any other AV software out there.... but this one's broken in a major way. I like it, I've tried just about all AV's & like the small size & footprint of Eset - Best AV there is & no issues on Windows 7. You do realise this is a beta right? And Windows 10 Build 10122 is itself a beta also right? Right? Great product but with one bug,. When downloading files with IDM Internet Downloading Manager, they are corrupted! There is no issues without Eset. I've been using this version for a couple of months. The Anti Theft feature will be a useful tool in case of theft. Ive been using ESET for several years probably 10. Starting with NOD32 and now ESS x32 and x64 with 5 computers today, and have tried many other leading security solutions along the way to make sure ESET is in fact who I want to go with and the answer has always been, without a doubt yes. In response to Music4Ever who states that the program leaves traces after uninstalling, while he's scanning with the program as he wrote it... how does he know this, and even if true (not) does he know that many programs leave data bits, has he tried CCleaner at all? And the link he posts has no mention about it. 5 stars all the way baby! @Music4Ever --> to each his own, enjoy your music. And take everything with a grain of salt from those cracked posters on Wilders. Indeed an interesting post. It's always been ESET. Version 6 final a big improvement over previous Eset SS, issues with the Betas sorted. If you do upgrade either from 5 or betas use the Eset uninstaller that's run in safe mode, removes just about everything & sorts any upgrade problems out. Seems to be heading in the right direction. Not come across any issues using this version - been using it since this morning. The new version 4.0 adds self protection and is still very light on resources. It's not perfect at detection for malware but what AV is, still need to use several software AV to be sure. I would never trust a single AV. I prefer Zone Alarm Pro Firewall to Eset's Firewall but Zone Alarm is slow and they take forever to get a 64-bit version released. Zonelabs will probably take forever to get a Windows 7 version out as well. 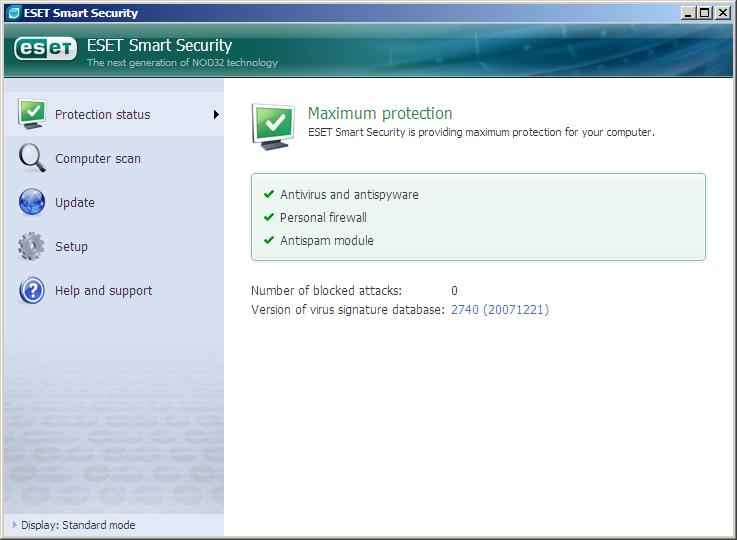 Eset 4.0 works fine on Windows 7 so far. Certainly seems an improvement over version 3. The connection to thier AV server seems a little slow at the moment, perhaps it's using a different server from usual, or it is just getting hammered with people trying this. At this stage the app is a bit sluggish and seems to use more resources than v3. Bottom line: Good for basic antivirus protection, doesn't have enough qualities to be a good security suite. I've tested both Home and Business Editions and found that the NOD32+anti-spyware is the best features. I had to create a rule on Vista Business SP1 before I could even touch my Windows Server 2003 and XP Pro SP2 boxes. But on SP2 and Server 2003 I got mix results. It's better if you had the standalone ESET NOD32 Anti-virus+anti-spyware as that does work better and forget the Smart Security all together!